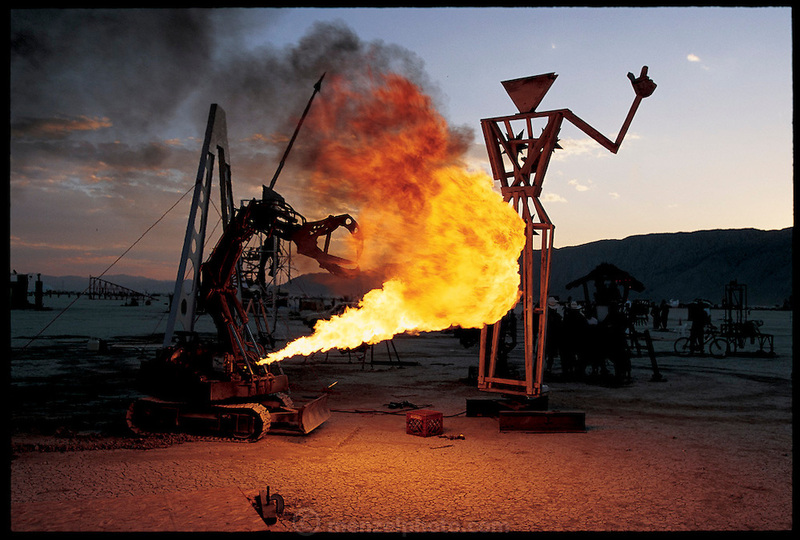 Christian Ristow's bulldozer-tracked, raptor-clawed robot, called Subjugator, fires its flame thrower during a test run for his apocalyptic show of mechanical mayhem at the Burning Man Festival in Nevada's Black Rock Desert. A former Columbia University architecture student who is now an artist in Los Angeles, Ristow stages mechanical performances in which his constructions fight each other and destroy designated sacrificial targets. With typical bravado, he called his Burning Man show, "The Final Battle of the Twentieth Century Between Man and Machine for Ultimate Supremacy on the Earth." From the book Robo sapiens: Evolution of a New Species, page 198-199.